Wondercore II is the new 10-in-1 home gym exercise machine- ab sculpting system that is the new and improved version of the very popular Wonder Core that was a 6-in-1 system that was designed mainly to target your entire core area to help you achieve the strong flat abs. 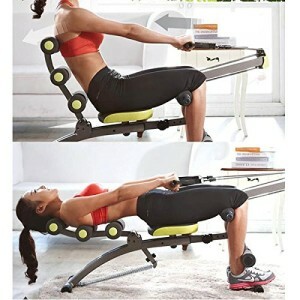 It comes with features that will get you good results, including a 180 degree motion range, dual resistance (20lbs max) and ergonomic back design and also a deluxe rowing system for you to do a range of upper body exercises on your biceps, triceps, back, shoulder, chest and more to give you a great overall cardiovascular and resistance workout at the same time. The exercises you can do on the Wondercore 2 include chest press, shoulder press, tricep press, arm curl, butterfly press, double pulley, back leg curl, bench press, leg extension and more. It weighs 23.81 pounds with a maximum user weight capacity of 265 pounds as it feels very sturdy and measures 9.84 x 33.46 x 13 inches, is quick and easy to assemble on your own and you will find the instructions in the package, has a foldable design so you can store it folded although it is still a bit bulky as folded if you live in a small apartment but this bulkiness is also an indicator of how solid and heavy duty this unit is and how it feels very stable in use. Wondercore II has an ergonomic design that makes it quite comfortable to exercise on with very good back support- the three dimensional soft cushion backrest rollers and is made of materials that are not harmful to the environment. 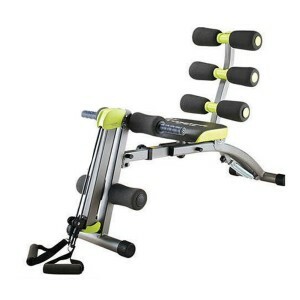 This is a great all round home gym workout machine at a competitive price that will give you a great overall workout with many benefits observed by customers including significant weight loss in just weeks, help with back pain, slimmer waistline, flatter abs and even six pack, improved posture, toned arms as there is quite a lot you can do on it. When you sit on its comfortable chair and lean back you will feel your muscles getting engaged immediately without any stress on your lower back and you can use it to warm up before playing sports or in the evening when you’re watching TV. If you combine it with a great nutritional plan you will definitely see faster and longer lasting results. In the box you will find the Wondercore II Trainer, Wondercore II Training and Exercise Guide, Nutrition Guide and 7 Day Meal Plan and Workout DVD with an Instructional 10 Minute Ab Toning Guide all of which are easy to follow and it comes with a 2 year warranty (1 year fabric) by the manufacturer.